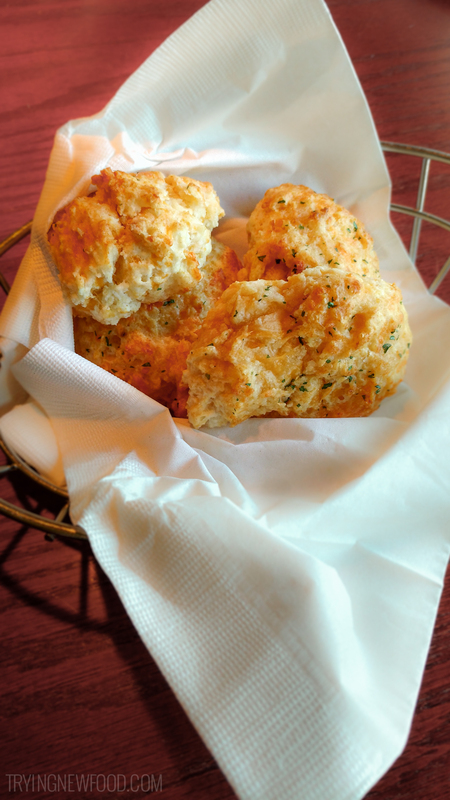 Started off the meal right with their Cheddar Bay Biscuits—buttery, cheesy, flaky perfection. Each one is 160 calories, but we ate two each so they’d bring another basket. That way we have a full basket of biscuits to bring home for later. 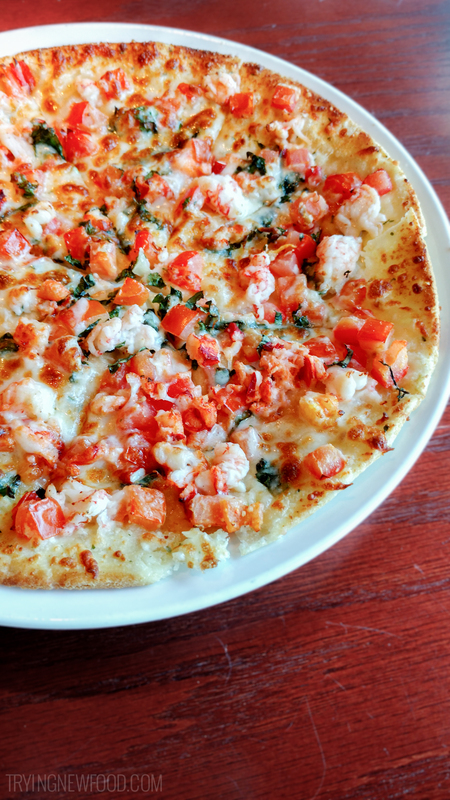 One of the Lobster Lover’s Lunch Specials is the Half Lobster-and-Langostino Pizza. We ended up ordering the full size pizza as an appetizer instead. First thing we noticed when it came out was that it’s a lot smaller than a regular-sized pizza. The thin crust reminded me of an opened-up quesadilla. That being said, we really enjoyed it. There was a good balance between the mozzarella, tomatoes, basil, and the Maine and langostino lobster pieces. The cheese was perfectly melted and everything tasted delicious. The appetizer is 710 calories, but the half serving for lunch is 350 calories. 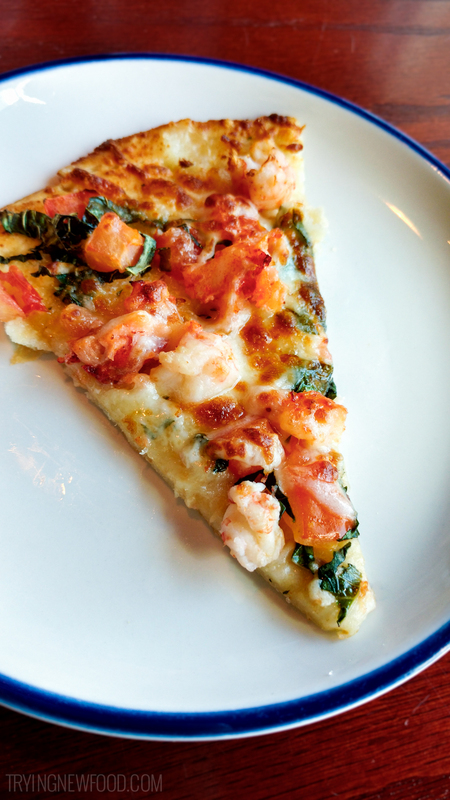 Here’s their Lobster and Langostino Pizza page for more details. Now here is the main (Maine) reason I dragged us out to Red Lobster for lunch. The Lobster Roll with Fries. Their site describes it as “sweet Maine lobster with lemon-basil aioli on a toasted roll.” This one is only available during their Lobster Lover’s Lunch on Monday through Friday from 11 a.m. to 3 p.m. 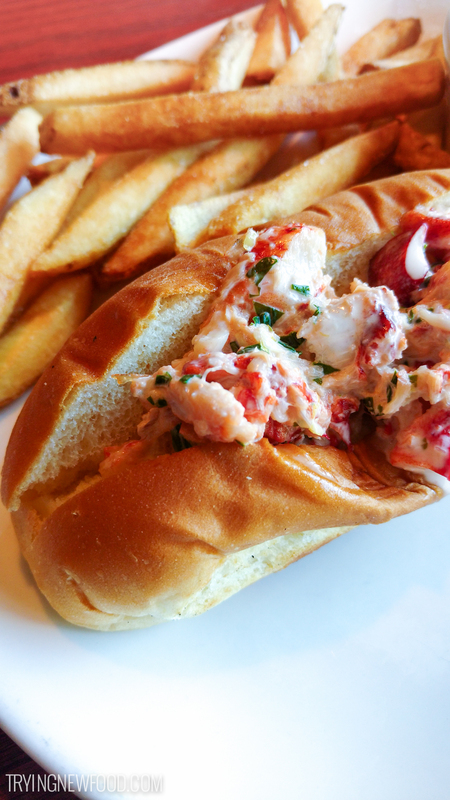 The Lobster Roll with French Fries is 540 calories. Once again, I was surprised by the size-difference from the photos online to what was presented in person. The roll itself was small, around 5″ long. There were two tablespoons or less of the lobster filling in the bun, not the overflowing portion shown in the menu photo. Proportions aside, it tasted AMAZING! Not only is the lobster tender and the aioli filling refreshing, with the flavor you’d expect from a lobster roll—but the bun tasted like potato bread! I’m a huge fan of potato bread and never considered using it for a lobster roll. Huge kudos to Red Lobster. Finally, there was my husband’s order of the Lobster-Topped Caesar Salad. It was a Caesar salad with the lobster filling used in the lobster roll. He said it was very refreshing and better than he was expecting. For his side, he got the New England Clam Chowder which I would recommend instead of the Lobster Bisque that I got with mine. 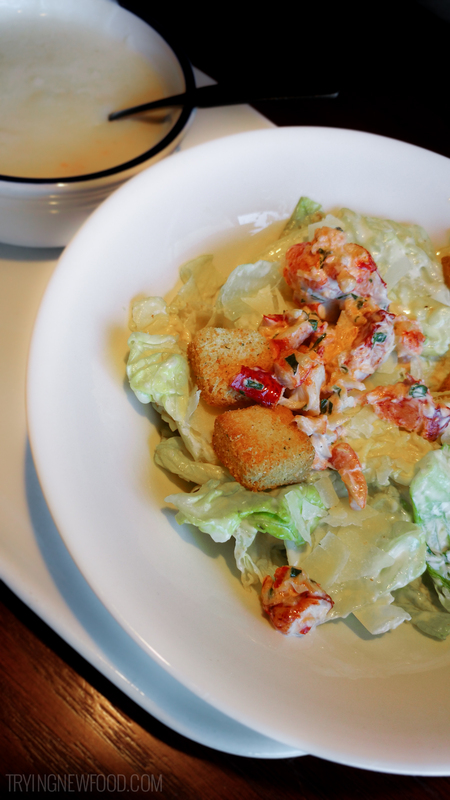 The Lobster-Topped Caesar Salad is 460 calories. We absolutely LOVED the Lobster Lover’s Lunch. I highly recommend trying the lobster roll. Too bad they only serve it for lunch. I could see two lobster rolls offered at dinner being a huge hit. Red Lobster, listen up! Have you tried any of the Lobster Lover’s Lunch, or any of their Lobsterfest meals? Let me know what you thought in the comments below!